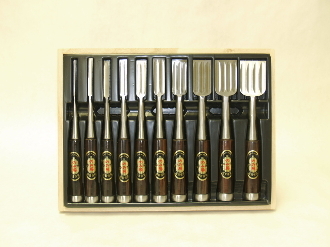 Koyama Premium 10 pc Ebony Handle Chisel Set with 4 Grooves!!! 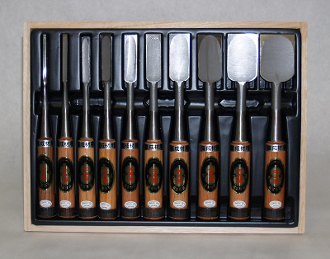 The blades of these Chisels are laminated with Hitachi White Paper Steel to the hardness of HRC64-67. These premium quality chisels perfectly meet wherever absolute precision is required, when working even the hardest woods. Outstanding edge life and the compact design make it possible to work ergonomic, comfortable and exact manner. 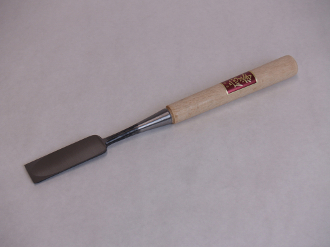 The soft iron body prevents cracks in the double-layered blade and dampens the vibrations of the hammer blows. Due to the angled blade, the cutting depth is increased to almost twice the blade length. As the back of the blade is hollow-ground, the contact surface is reduced,which thus decreases the friction. The multiple grooves on the back of blade are for improving support when working near edges. 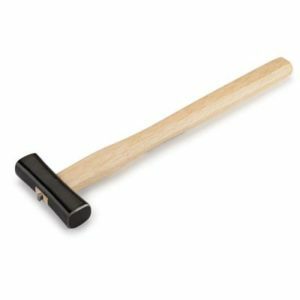 The handles are made of the premium Ebony hardwood, mounted with sturdy steel ferrules at both ends, and are designed for efficiency when driven by an iron hammer.